Disruption of contact between cells may initiate neurogenesis from precursors that express enteric glial markers. (A) A cartoon depicting the intact myenteric plexus as it appears in a whole mount of a laminar preparation of the intestinal wall. The neurons (red) are shown as they appear when a marker, such as HuC/D, that is restricted to the perikarya is immunocytochemically demonstrated. The neurons are surrounded by a dense network of enteric glia (green), which are depicted as they would appear when demonstrated immunocytochemically with antibodies specific for a marker such as S100β. Neural pathways interconnect the ganglia, but they and the tertiary plexus of nerve fibers that innervate the longitudinal muscle are seen only with the glia marker because axons do not contain HuC/D. Boundaries between adjacent glial cells are not readily detected. At steady state, as shown, there is no neurogenesis. (B) An intact ganglion (left) is depicted in an actual photomicrograph immunostained to visualize HuC/D and S100β simultaneously (scale bar: 35 μm). 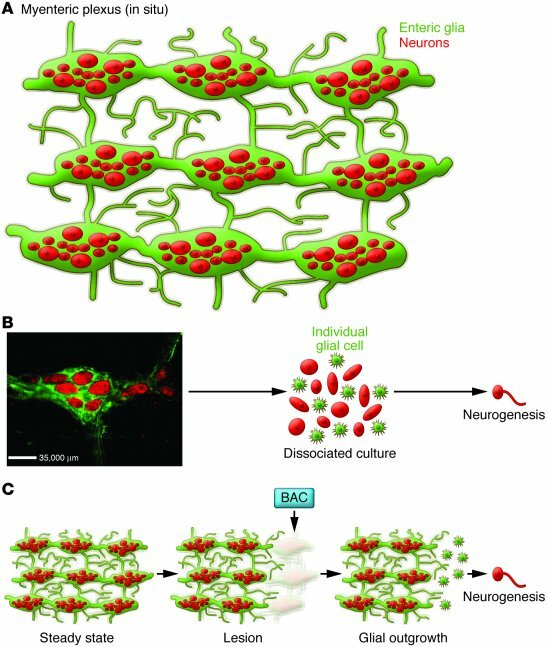 When ganglia are dissociated (right) and cultured, the networks of glia and neurons are disrupted and a subset of glia give rise to neurons. 5-HT, which is present in culture media, may also activate 5-HT4 receptors to stimulate neurogenesis. (C) Although neurogenesis from glia does not occur in the intact ENS at steady state (left), its disruption by BAC (center) leads to a glial outgrowth, and a subset of these glial cells, now no longer in contact with each other, may initiate neurogenesis.